The Cumberland & Dumfriesshire Farmers Mart P.L.C. had forward 48 prime cattle, 0 young bulls, 15 over thirty month cattle, 822 prime lambs, 4,642 prime hoggs and 3,532 cast ewes & rams at their weekly sale at Longtown on Thursday 3rd June, 2010. Prime cattle saw trade sharper on the week with averages for all classes dearer. Top price of 177.5p and 175.5p for Limousin heifers from J. & N. Blaylock & Son, Hallburn and purchased by Jewitt Wholesalers and Border Meats Butchers, Lockerbie. Limousin bullocks to 167.5p from J.C. & D. Nicholson, The Gill and purchased by W. Kirkup & Sons Butchers, Longtown. Limousin bullocks £1,214.65 Sceughdyke, £1,084.60 Dashwell Green and Haining House; Charolais £1,124.65 Sceughdyke, £1,026 Dashwell Green. Charolais heifers £1,105.20 Sceughdyke; Limousin £1,017 Hallburn, £982.40 Sceughdyke. The 15 OTM cattle again met a fine trade with more Black & Whites on offer. Top price of 103.5p for a Friesian heifer from Mr E.A. Dodd, Roanstree. Friesian cows to 95.5p Halltown, 89.5p Roanstree, 87.5p Halltown, 82.5p Evertown; Limousin 89.5p Harelawhill; Blue Grey 87.5p Laalsteins. Friesian cows £725.80 Halltown, £680.20 Roanstree. The largest show this season of 742 prime lambs levelled out at 203.3p per kilo, with a top price of £104.80 for Bleu d’Maine lambs from Louise Brough, Old Rectory. Texel £104, £100 Thorns, £96.20 Cardew Hall; Suffolk £98.50 Croft House, £96.50 Cocklet Hill; Charollais £93.50 Old Rectory, £79.80 Westend; Ryeland £85.50 Croft House; Jacob £83.50 Zetland; Dorset £77.20 Zetland; Cheviot Mule £73.80 Netherplace. An exceptional show of 4,642 prime hoggs for this time of year. Many consignors were yet again having an end of season tidy up, but good well fleshed hoggs were regularly selling in the 175p-185p per kilo region. The overall sale average was 165p per kilo. Top per kilo of 226p for Texels from Newbigging and to £102.50 per head for Greyfaces from Wydon Eals and Texels from Newbigging. Other Texels £100.50 Stackbraes, £100 The Bank; Beltex £100 Stackbraes; Leicester £100 Nether Stenries; North Country Cheviot £95.80. £90.50 Sockbridge Hall; Suffolk £95.50, £92.50 Stackbraes, £88.50 Hallrule Mill; Greyface £94.50 Sockbridge Hall; Hill Cheviot £93.50 Lydden Court, £90 Glendearg; Oxford £90, £88.50 Golden Lane; Jacob £90 Kirkland Green; Charollais £88.20 Golden Lane; Blackface £85.50 Laythes, £79.50 Nether Stenries, £77.50 Sockbridge Hall; Easycare £84.80, £79.80 Golden Lane; Zwartbles £80.50 The Bank, £79.80 Golden Lane; Lleyn £80.50, £74.80 Sloda Hill; Clun £78.50 Golden Lane; Shetland £74.80 Sockbridge Hall; Swaledale £69.80 Sockbridge Hall, £63.50 Haithwaite; Woodland £54.50 Stackbraes; Herdwick £53.50 Sockbridge Hall. 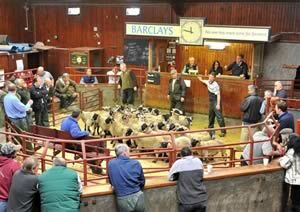 The 1,017 lightweight hoggs sold to £74.50 for Texels from Newbigging; North Country Cheviot £59.80 Sockbridge Hall; Hill Cheviot £56.50 Lowfield Cottage and Sloda Hill; Blackface £55.80 Burnbrae; Herdwick £53.80 Sockbridge Hall; Kendal Rough £53.80 Haithwaite; Greyface £50 Newington; Swaledale £49.80 Sockbridge Hall; Shetland £48.80 Sockbridge Hall. A similar show of 3,532 cast ewes and rams saw trade slightly sharper on the week. Heavy ewes were easier to sell with a top price of £140.50 for Leicester ewes from Messrs Lawson, Stubsgill; Suffolk £130.50 Huntington, £127.50 Roadside, £118.50 Severs; Texel £132.50 Thorns, £124.50 Coytre, £120.50 Severs; Beltex £118.50 Tercrosset, £100.50 Stackbraes, £96.50 Aspatria Hall; Zwartbles £110.50 Mouswald Grange, £88.50 Thorns; Half Bred £108.50 Huntington, £92.50 Kirkland Green; North Country Cheviot £100.50 Sockbridge Hall, £96.50 Tofts of Tain, £94.50 Damside; Charollais £93.50, £91.50 Golden Lane, £88.50 Church Road; Bleu d’Maine £89.50 Stackbraes; Greyface £87.50 Mossburnford, £85.50 Stackbraes, £83.50 Mossburnford; Ryeland £85.50, £75.50 Kirkland Green; Cheviot Mule £76.50 Woodend; Rouge £76.50 Severs; Dorset £76.50 The Farm; Clun £73.50 Golden Lane. Hill ewes to £80.50 Kellah, £66.50 Barron House, £65.50 Stackbraes; Hill Cheviot £76.50 Sockbridge Hall, £75.50 Stackbraes, £69.50 Glengolly; Lleyn £75.50 Pilmuir; Swaledale £64.50 Stubsgill, £57.50 High Lovelady Shield; Hebridean £43.50 Bengall. Rams to £136.50 for Texels from Stackbraes, £133.50 Coytre; Charollais £132.50, £118.50 Coytre; Suffolk £130.50 Sockbridge Hall, £126.50 Kirkland Green; Zwartbles £128.50 Severs; Hill Cheviot £116.50 Oakwood Mill; Dorset £108.50 Severs; North Country Cheviot £89.50 Newbigging, £80 Oakwood Mill; Jacob £80.50 Kirkland Green; Blackface £64.50 Over Cassock.